Again, not just white villages today. A long day. Theoretically only 25km. 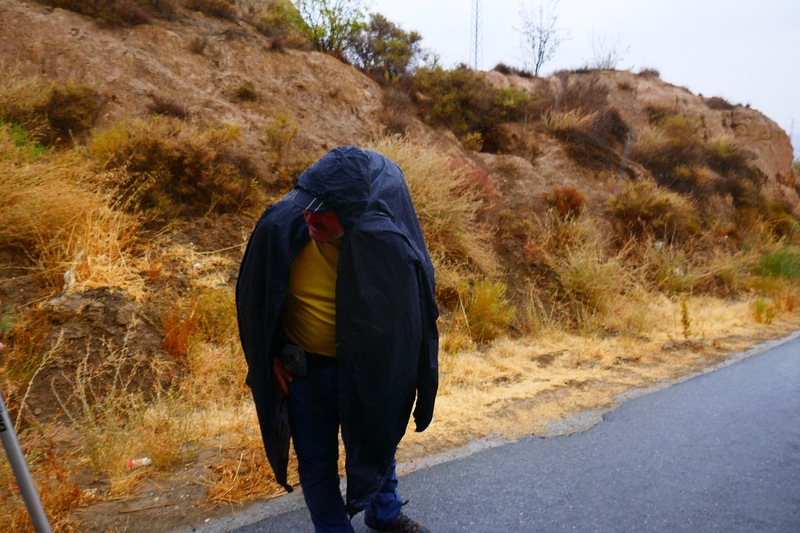 Add on at least another 3, in the rain, looking for the Guadix albergue. It’s in an old part of town. Subtext: goat tracks and curved streets to avoid being shot by arrows. So, find the cathedral, we’d long ago lost the yellow Camino arrows, no, not the other church. 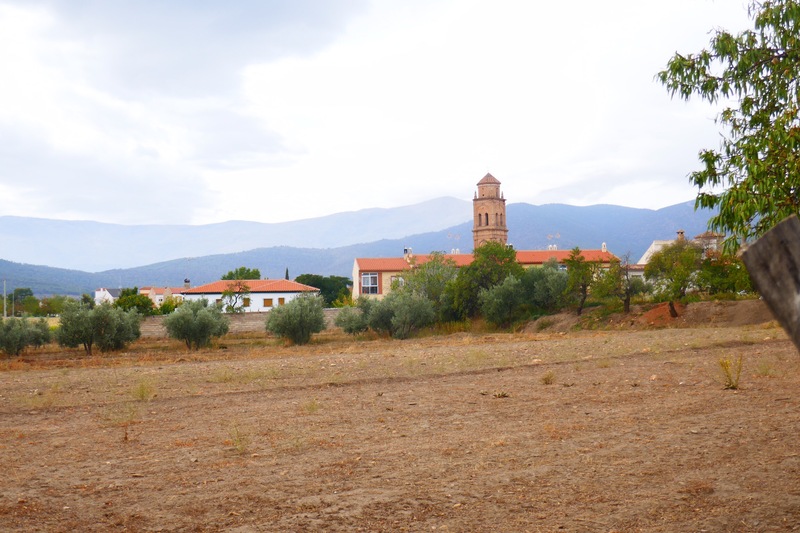 Ok, find cathedral, turn left, left, right, through a plaza, sharp left or was it right, ….get the picture? Yup, we did a few circles. Using an iPhone in the rain, keeping it dry and using the screen? Not easy. Maybe not possible. I obviously need an iPhone 7+ before I walk anywhere ever again. 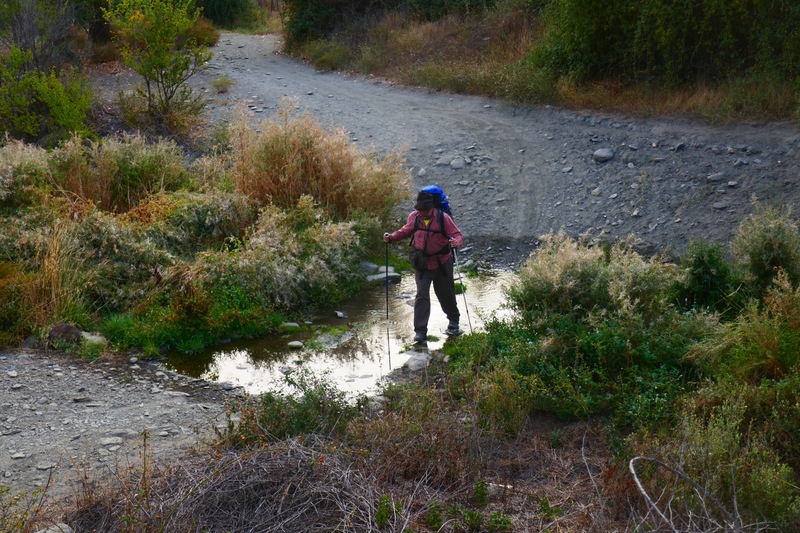 We all had wet feet, having crossed one creek without stepping stones or another option as in most. 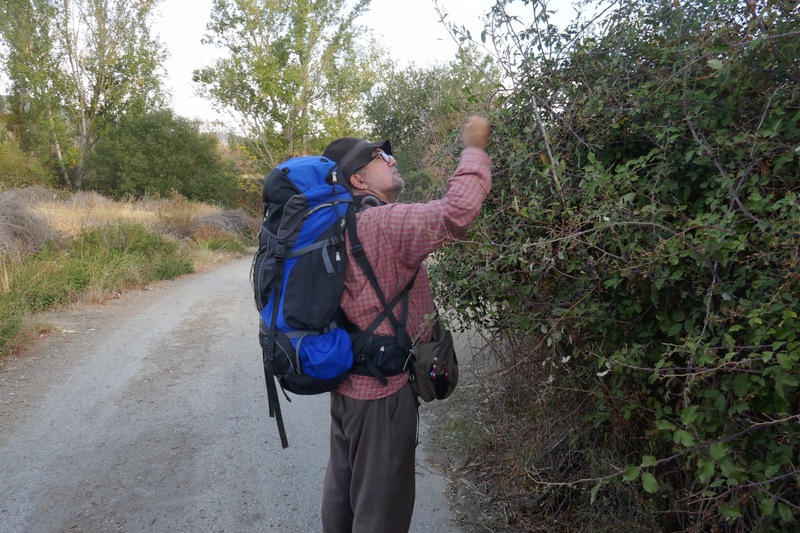 Ripe blackberries near the first little town both going in and out. Hmmm, the three of us grazed. I learnt where babies come from. 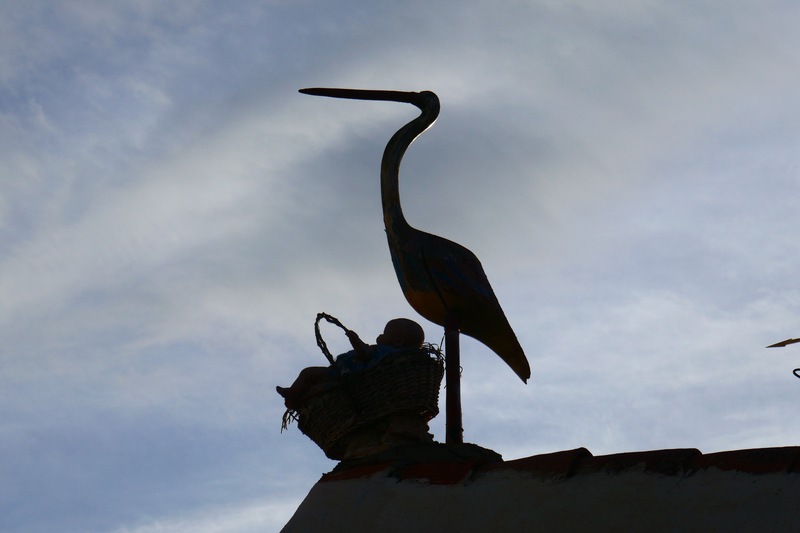 Yes, a stork on the roof in the town of Jerez del Marquesado was carrying one. Presumably ready for delivery. Too high to be sure. and we walked along the best street in the town for 2016. Today is Spain’s national day, el Día del Espanidad, el Día del Santa Piña and the day Columbus discovered America. 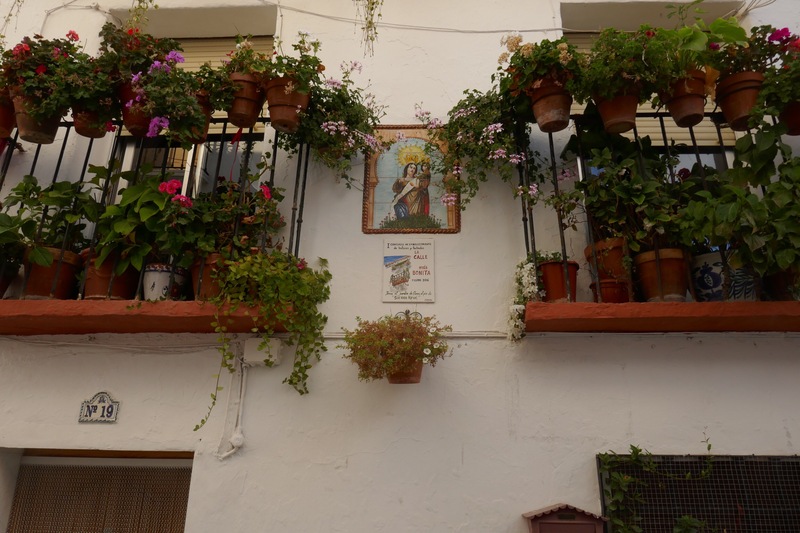 So yes, the bars in the first town, Jerez del Marquesado were shut. Dammit. Never ever count on them being open. If it’s not a fiesta in that town it’s on in the adjacent one. A few hills, pine trees, easy walking generally. 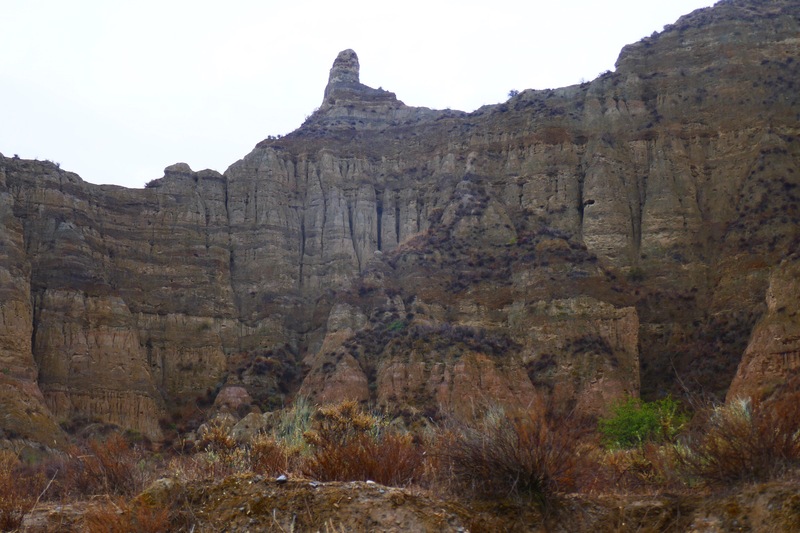 We struck it very lucky in the next town, Cogollos de Guadix. The guy serving in the bar there was one of the nicest I’ve encountered behind a bar. B and M variously had beers and an anisette drink. Me? A coke light and a couple of coffees. And back on the road this time. 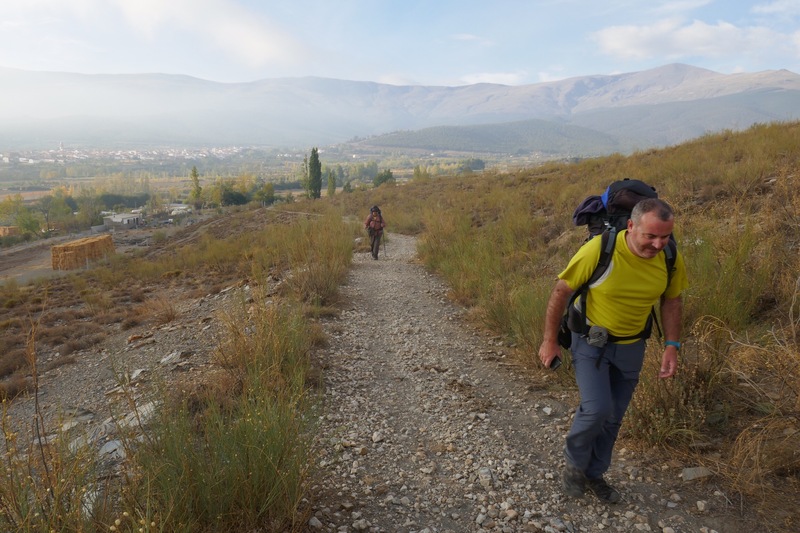 For most of the next 12km, B and I sorted out the world, everything from the qualities of olive oil to Scipio Africanus. He was very patient and is as happy to talk as I am to listen and add what I can when I can. Truly, everyday I can understand a little more. It’s my increasing familiarity with their respective accents plus, hopefully, an ever growing vocabulary. We walked past many caves dug into the ‘badlands’ type of hills around here. Some are obviously still functional, lived in, and some not. I love the badlands and was so sorry we had to keep moving. Rain was falling and I didn’t take many photos. 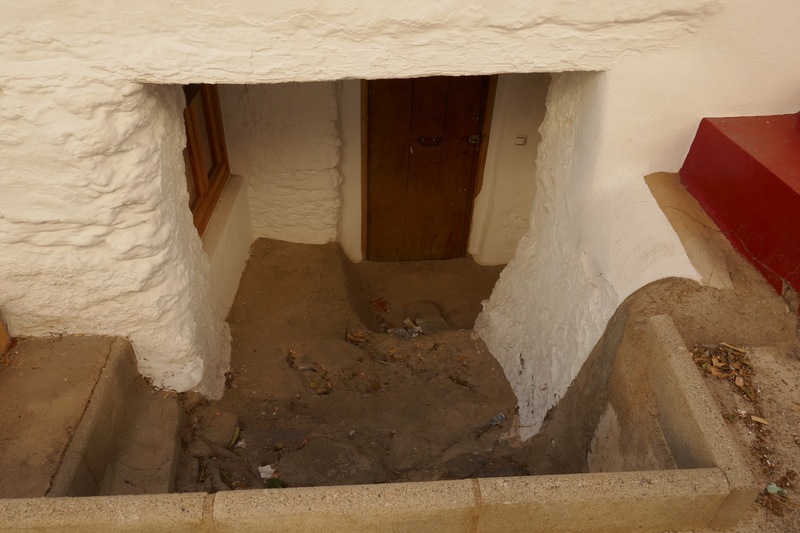 I particularly missed out on the many caves in this city, Guadix. There’s clearly a tourist industry built around them and it’s not hard to see why. White house fronts in many cases with the rooms behind built into hillsides. Chimneys stick up out from the hill behind. Walking into town in the rain excited one person who shall remain unnamed! 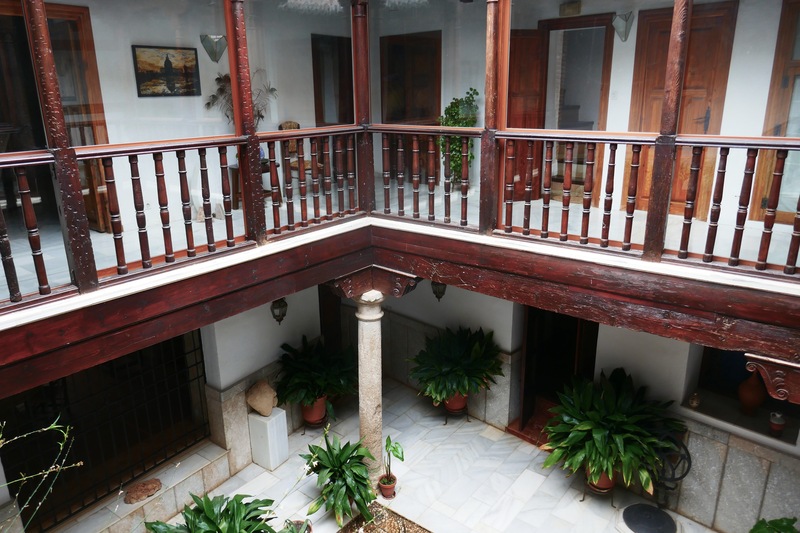 Guadix is, I reckon, one of the places to come back to see in nice weather. Found a soldier (actually Guardia civil). Poor thing didn’t know what was happening until it was too late! Yes, we were damp, unshowered and needing to eat before everything shut. But a soldier? In drag? Yup! It was really his hat that I loved, that strangest of shapes plastic lid with braid. Interesting travelling with B and M, how locals open up to them. I like it. Remember I commented on a German woman who is currently walking this same section? We ran into her in Finaña. She is older and has a very small pack and no sleeping bag. She is now behind us and it sounds as though she’s had problems because of her lack of Spanish. 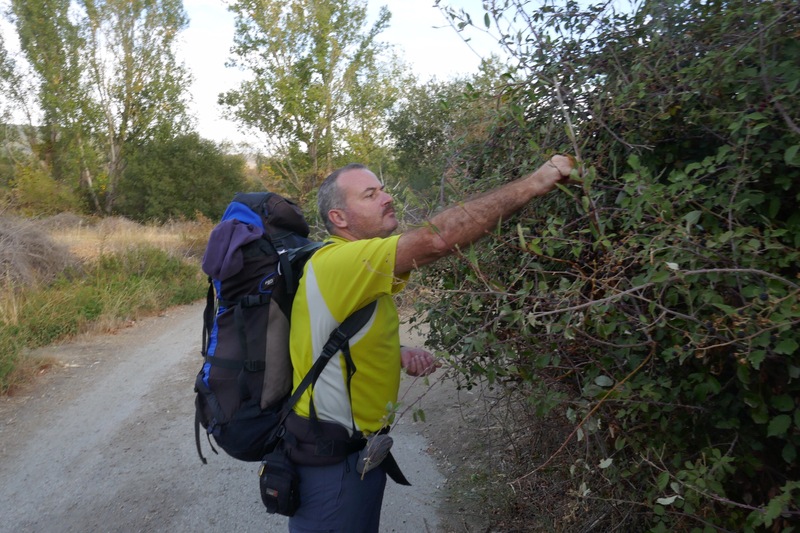 The web of people who run albergues and casa rurales along this Camino keep each other informed as to who is coming, where they are etc. 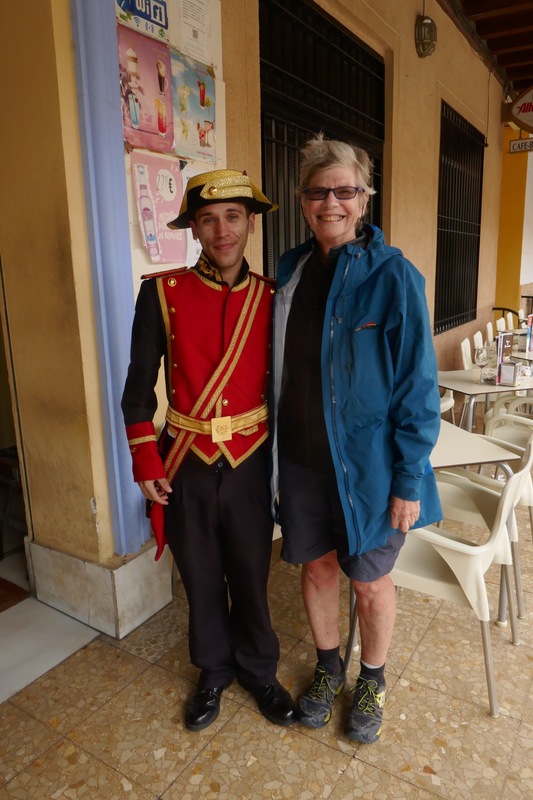 The german woman told me, in english, that she speaks some Spanish. Turns out she may not speak enough to use the phone to ring an albergue or anyone. So, unless she gets a lift, I doubt our paths will cross again afterall as she must be well behind by now. 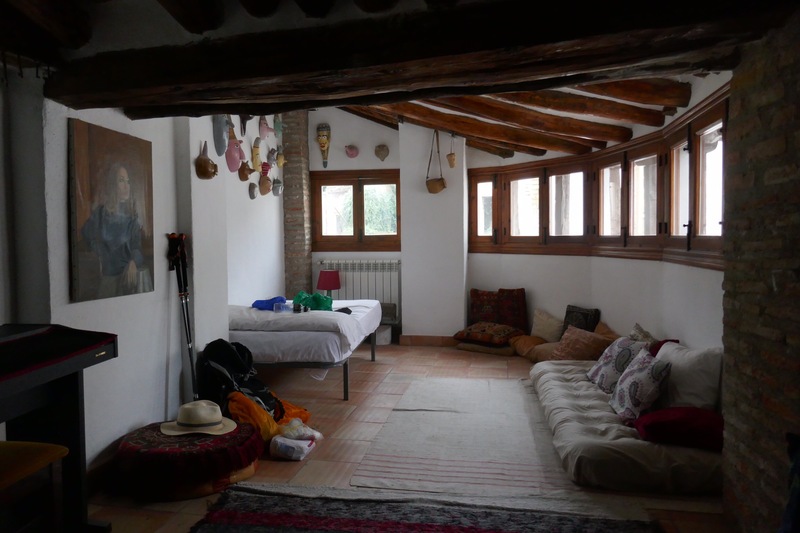 The guy running the casa rurale/albergue was interesting. Looking as though he couldn’t walk he apparently decided to establish his place after walking the Camino Frances. Funny when you really are an outsider and can’t pick the subtleties reliably as you can in your own milieux. You are an outsider in so many ways. Interesting. 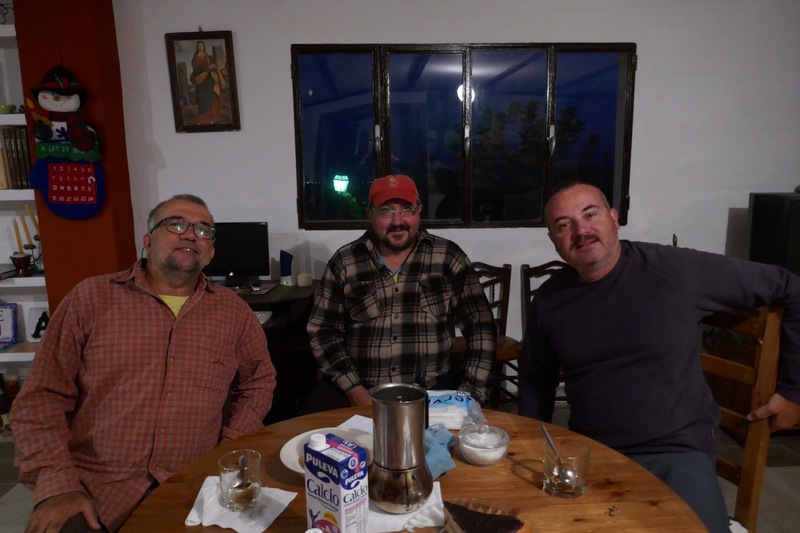 Anyhow, our albergue guy Manuel, in the centre, visited us after dinner last night and brought us breakfast at 07:30. Especially nice of him as he wanted it to be much later. We knew it might rain, could be a long day and needed an early start. He kindly obliged. You couldn’t get a more different place, or owner, if you tried. Manuel is a farmer and our owner tonight is a sculptor. Her place is lovely as you can tell. Very different. I’m sleeping in an alcove on the only mattress on a bed. Access is low. If I don’t duck it’ll be my last walk! 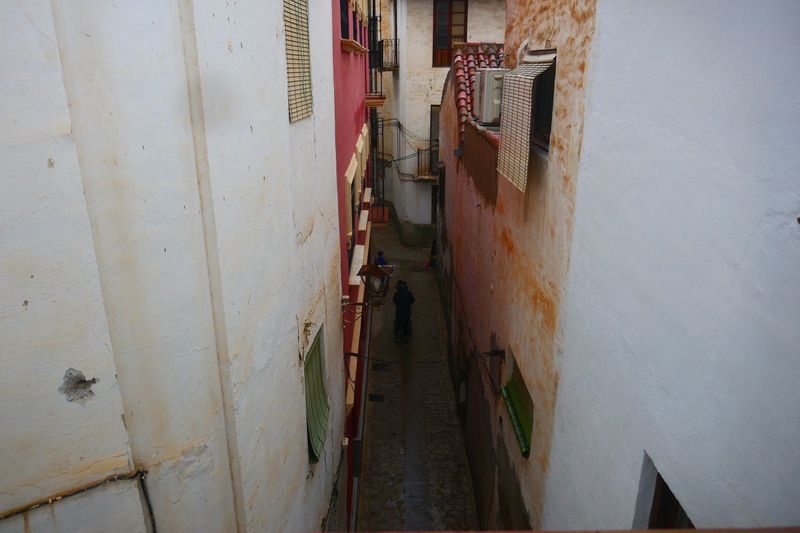 And some alleys here are, I’m sure, too narrow for cars. The neighbours are very close. More rain is expected tomorrow. I’m glad we are out of the river beds, not knowing how to read what is happening and when it could be dangerous.